Halifax have been warned to expect a strong second-half showing from Chesterfield on Saturday by Graham Smyth, who covers the club for the Derbyshire Times. 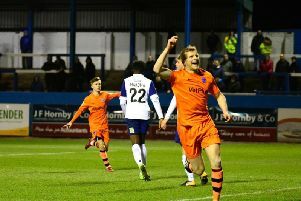 Of Chesterfield’s last nine goals, eight have come in the second-half of games, which have helped them rescue draws against Ebbsfleet, Hartlepool and Solihull, the last of which saw them come from behind twice. “Chesterfield, this season, have been a side who play better after the interval, for whatever reason,” said Smyth. “They have in Jonathan Smith and Will Evans, a pair of players who have been pretty consistent of late and influential in the better results. The Spireites have had a hugely disappointing season, kicking off the campaign at 7/1 to gain promotion but finding themselves in a scrap to avoid relegation. “It has been yet another tumultuous season for Chesterfield,” said Smyth. “For the third consecutive season they’re staring relegation full in the face. “No one expected the season to go this way when they appointed experienced operator Martin Allen in the summer, yet here we are. “Poor recruitment is once again to blame and new boss John Sheridan, in his own words, has a lot of work to do to keep the Spireites afloat. “It’s still very early days and it’s difficult to assess just how influential he’s been in the results they’ve obtained. “One thing you can say for certain is that they’re trying to play more attractive football. Smyth says striker Marc-Antoine Fortune could recover from his hamstring problem in time for the game, but defender Brad Barry is not expected to be back, having suffered a more severe hamstring issue. Midfielder Charlie Carter and defender Laurence Maguire - brother of Leicester and England’s Harry - might be fit to return after respective surgeries. Smyth added: “Alex Kiwomya can be a handful with his pace, Lee Shaw is a real pest but usually plays out wide rather than up top and Halifax will know all about Tom Denton’s strengths.